I cannot put into words the satisfaction I felt when I arrived home after my first grocery trip with all twelve eggs in tact. I rode my bike with a weeks worth of groceries tied on and didn’t break a single egg! 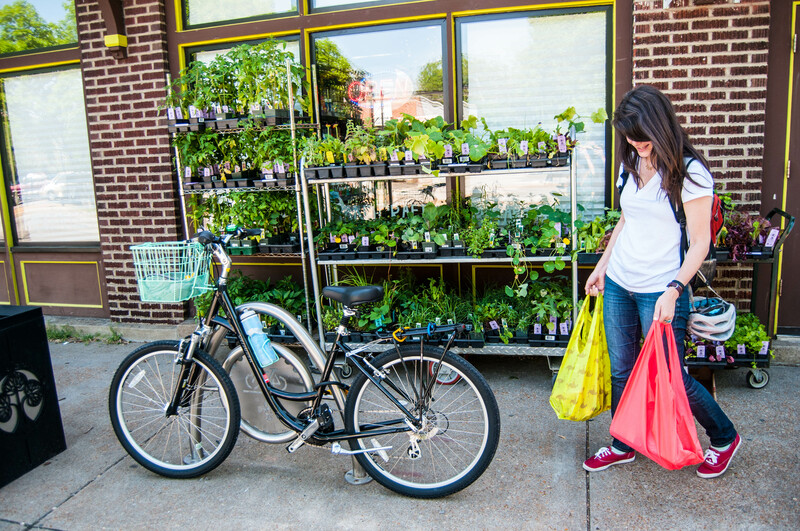 A weeks worth of groceries for me only filled up two baggu bags – but I did it – I grocery shopped on a bike. When I decided to give up my car for a month, this was one of the things I was most worried about. How was I ever going to get all the things I needed from the store to my house? Turns out, I don’t actually need that much stuff. I bought two baggu bags specifically for grocery shopping because they’re sturdy, fit a lot of things inside, and – most importantly – they come in fun colors and patterns! The basket on my bike helped, as did the rack on the back. I headed to the neighborhood grocery, Local Harvest. Having a store close sure makes my weekly trip convenient. 1. 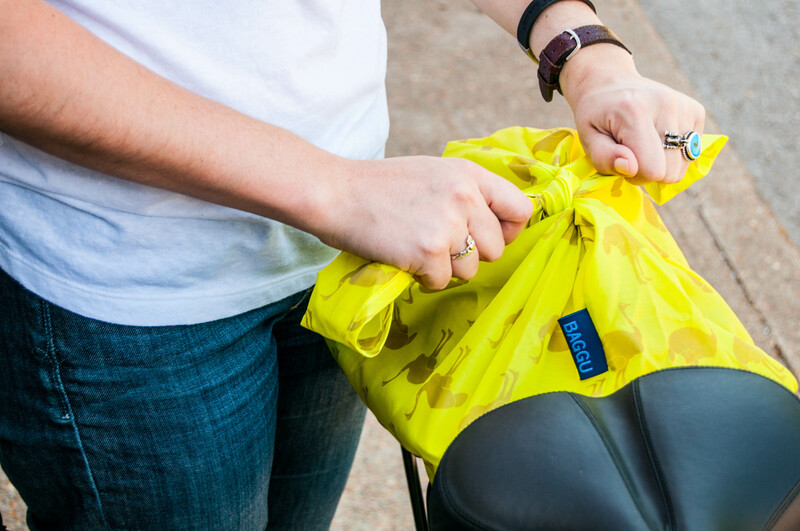 Invest in re-useable shopping bags – even better if you can tie them shut. 2. Get a basket. And a rack. And some sort of bungee cord/rope. That’s about it. My trips have certainly been more frequent – once a week (sometimes twice) versus every two weeks. I’ve also noticed that I’m buying more fresh foods as opposed to packaged foods because I’m going so often, so YEAH to healthy eating! This whole car-free thing has really thrown my lifestyle into a tizzy. I’m wayyyyyy out of my comfort zone, but if I hadn’t done it, I couldn’t sit here and tell you how gratifying it is to know you haven’t broken a single egg on your ride home. Ditched the car at all this month? 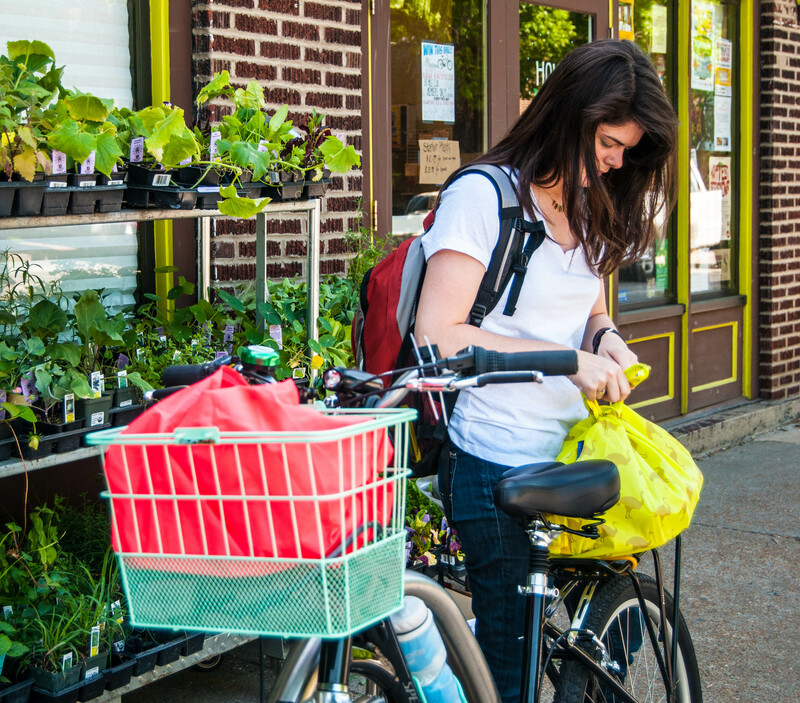 Or tried to grocery shop on your bike? 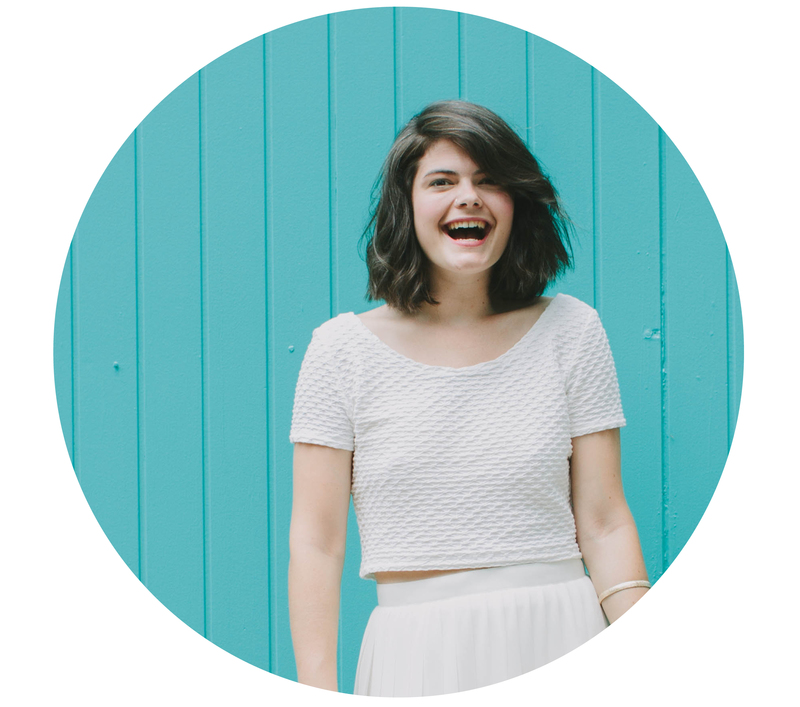 I want to hear how you tackle regular errands like grocery shopping! Even though I’ve biked with eggs numerous times now, I always anxiously open the carton the moment I’m home — no breaks yet! If possible, I use a spare bag, small towel, etc. as padding, but that’s definitely optional. 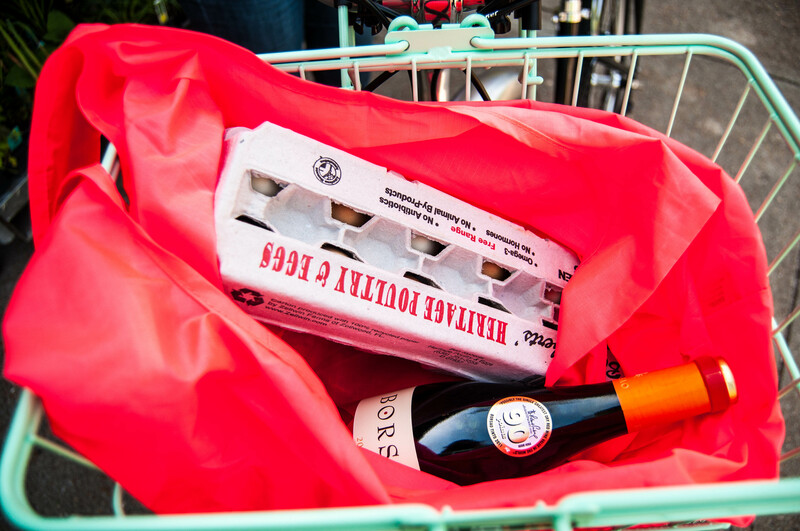 Looks like you have a nice set-up for small- to mid-sized grocery runs. Having stores within a mile or two also helps. I wish I could do my grocery shopping on a bike but I am shopping for a family of 5. Most of the time I need to take my SUV so that I can fit everything and a cooler to protect my frozen items. I have taken to doing as much shopping as I can at the local farmers market but even that is way more than a bike ride away. I shop for a family of 4 and pets. A cargo bike give us room for three people (two small, one big) and all the food we eat in a week or two. 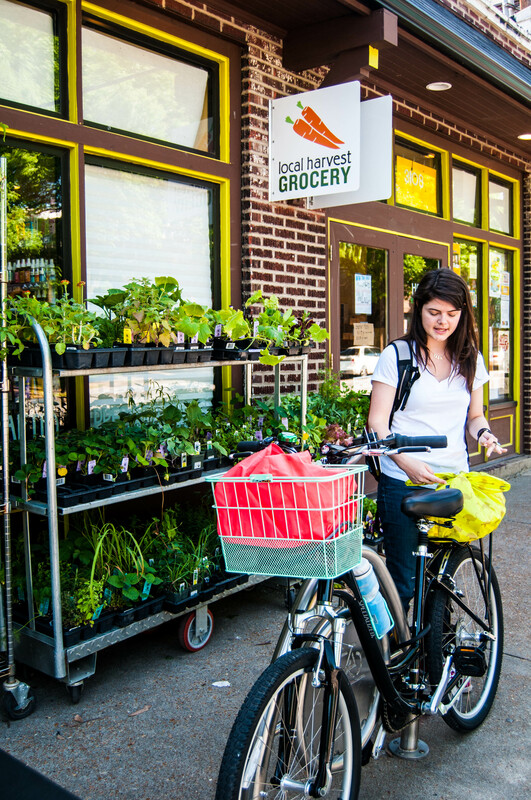 Not that we always bike to the grocery store, but we do it a fair amount. 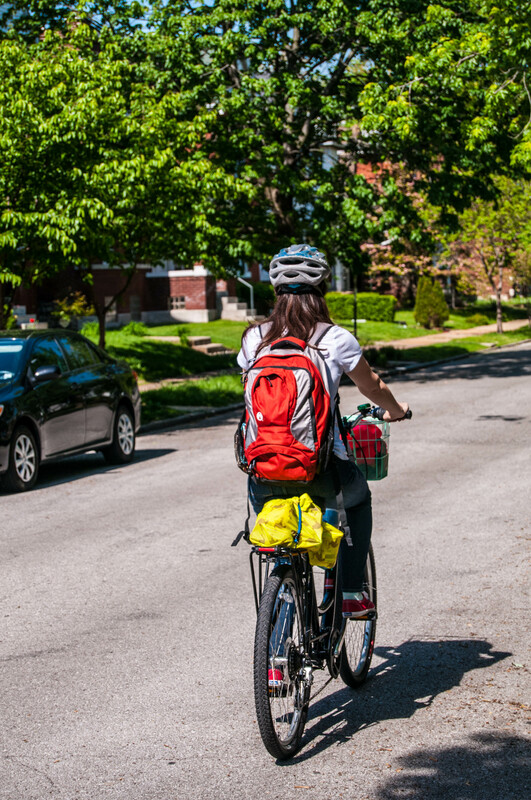 I am so pleased that you like using your bike so much 🙂 Will you continue biking instead of driving your car?